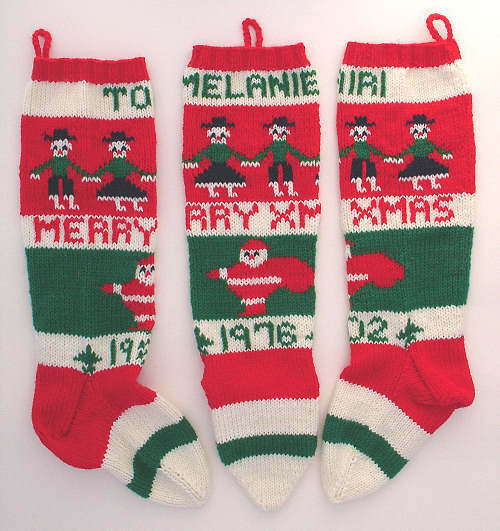 Here are some custom Christmas stockings that I've knit with different pictures on them. An infinite variety of combinations are possible, of course. By combining Different Pictures it's possible to create a completely unique stocking. 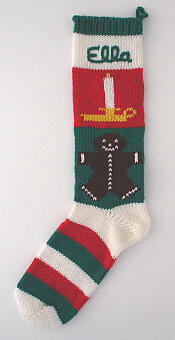 Please look to see what Customers Say about stockings I've knit with different pictures on them. For this custom stocking, I started with a drawing from a coloring book. A photo of Ronnie's actual snowmobile helped me with the colors. I created a smaller version of the picture also, but we chose to go with the larger one for the stocking. I created a knitting chart from an outline drawing for this unusual design. A giant wreath and sprigs of holly form an elegant background for these angels, whose soft wings are knitted in angora yarn. 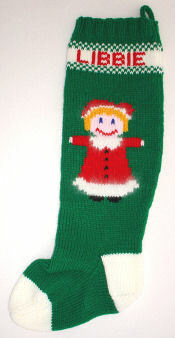 Front view of the same stocking. A very cheerful design in bright colors was a special request for a customer's grandson. The classic 3-stripe arrangement is infinitely adaptable. The pictures wrap around to the other side of the stocking, where the reindeer's head can be seen. A few strategically placed sequins brighten up the details. This wreath is nicely proportioned. It's decorated with round sequins. The old-fashioned candles could be done with a yellow flame instead of the red seen here. One family used variations for different generations: Santa for parents, reindeer for children. The gingerbread boy and girl pictures make a wonderful set for siblings or spouses. The boy has borders with tiny candy canes. The girl has miniature bells in her border stripes. These designs are very cheery, perfect for children. A variation of the same gingerbread girl with a big heart. The tone is different, since the background is simpler and there is more white to lighten the effect. The focus on the gingerbread girl is much stronger. 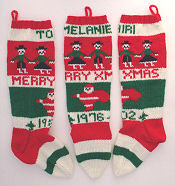 These three stockings were created for members of the same family. The parents chose different pictures for each individual. The reindeer and candle pictures are borrowed from some vintage stocking patterns. The simple gingerbread man adds a cheerful note. Rudolph and the colorful angel were nice choices for a little girl. This set of stockings was also created for a family. The mother chose pictures to suit her three children. The simple snowman is dressed up with fluffy angora yarn. The top border of drums was a very nice choice to complement the toy soldier. The tiny train travels all the way around the stocking. These ornaments originally appeared on the back side of a Santa stocking. Of course, they can be used in other ways. This pair is plain. 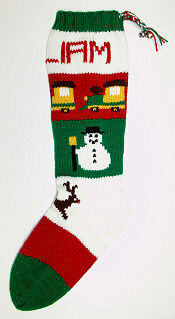 On this stocking, the ornaments are embellished with sequins. The white stripe is covered with white sequins, and the red section are outlined with red sequins. This is an old stocking design that allows for many variations in the different pictures. A fairly minor variation in color choices creates a very different look. These are smaller than most of my stockings, in order to match existing family stockings. The tree was shrunk to allow room for a date, and an extra stripe was added to accommodate the phrase "Merry Xmas". The non-traditional colors of these stockings create a very different effect than the classic colors used in the two previous pictures. The back of a Santa stocking. 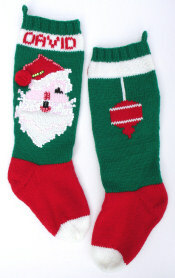 This can be dressed up a bit with a black sequin on the eye and a small jingle bell at the tip of his hat. The backside of one of the Santa stockings. The front shows Santa standing below the mantel, reaching for a stocking. An unusually detailed design is made even more elaborate with the addition of numerous embellishments. The house is nestled between two trees, while Santa and his reindeer fly overhead. A classic 3-stripe design, with pictures chosen for the customer's grandson. 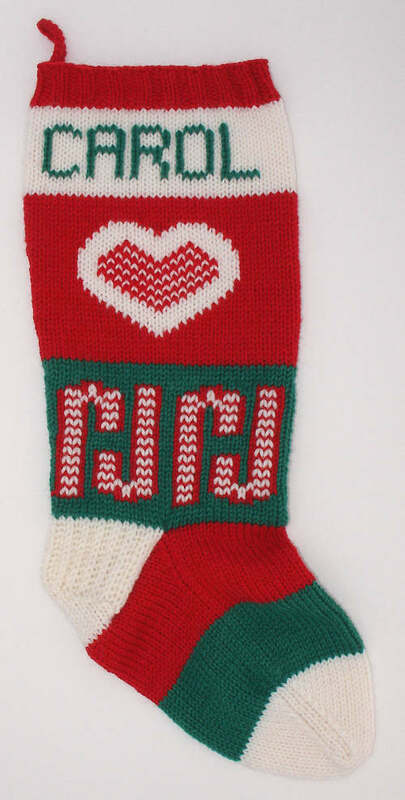 The unusual colors in this stocking were chosen by the customer to harmonize with her living room decor. The bell on top reminds me of the bell-ringing choirs. This relatively simple design is quite striking, with strong shapes and just enough detail. The reindeer has a red nose for a bit of fun. A stripe pattern is decorated with added embellishments. The wreath is knit in, but the gifts are buttons while the bells and berries are sequins. This ornament is very graceful. Its simplicity is a nice contrast to the heavily sequined Santa on the front side. This is a very well-balanced use of pictures in combination. I love this gingerbread man design. The stocking is in wool. 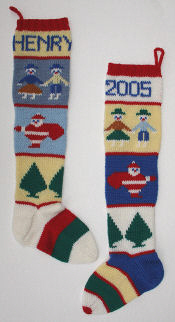 This is another wool stocking that uses different pictures to good advantage. The stripe arrangement matches that in the husband's original stocking. This cute little girl is wearing a holiday coat and hat, both trimmed with angora. If you'd like a Christmas stocking with different pictures on it, find out more about ordering custom Christmas stockings.